Mule Deer are one of the majestic icons of the American West. Elusive and always alert to danger, they are admired by hunters and outdoorsmen. Mule deer (Odocoileus hemionus) are stout and stocky, powerfully built, and about a third larger than their cousins, the whitetail deer. They are a very popular game animal that is difficult to hunt, due to their keen senses and awareness of their surroundings. American Expedition is proud to present information, interesting facts, and photos of the Mule Deer. Mule Deer are the largest member of the Odocoileus genus. They gained their name from their large, mule like ears which they can move independently, allowing them to survey their surroundings for sounds of potential danger. Mule deer stand 40 to 42 inches tall at the shoulders and weigh an average of 200 pounds. 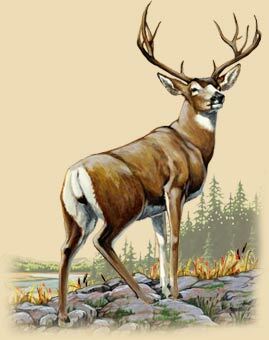 Males, or bucks, have antlers and a larger body than the females, known as does. Mule deer can reach speeds of up to 45 miles per hour while running, and are capable of changing directions in a single bound. Mule deer have a unique leaping gait, in which all four of their legs touch the ground at the same time while running. They are uniquely adapted to desert and arid environments, as they can use their hooves to dig holes into the ground when searching for seep water. Bucks carry a prominent set of antlers, which are grown annually and are shed in the February or March. A set of antlers is made up of a number of different “points.” The length and number of tines is determined by nutrition, genetics, and age. While the antlers are growing back, they are covered in a fine tissue called velvet. The velvet supplies blood to the antlers, allowing for development. After the antlers are fully grown, the deer will rub them against trees to remove the velvet layer. 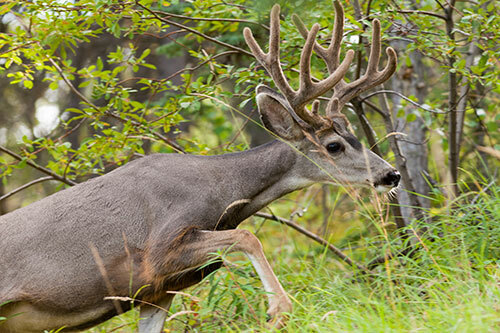 A “spiked” buck is a male deer lacking a set of antlers. Instead, “spiked” bucks have a pair of vertical spikes in place of antlers, usually no bigger than three inches. “Button” bucks are male deer with very small stubs at the base of where the young deer’s antlers will soon grow, but have not broken the skin yet. Sometimes, these antlerless bucks get mistaken for does, but it is important to learn to identify the differences in body structure between the two sexes. Mule deer mate in the fall and winter, during the "rut." when male bucks will compete with each other for breeding opportunities. Dominant bucks will collect several female does to form a mating harem, and aggressively defend their females from other males in the region. The largest bucks with the biggest antlers do the most mating; size is the main factor in determining which bucks get to mate. Mating season lasts from October to November and gestation period lasts about 204 days. The male will then leave and the doe will give birth to 1-4 deer (usually 2), in May or June. These young deer, called fawns, are reddish-brown with a speckled white back. After a year, the fawn will leave its mother and venture out on its own. Mule deer usually live about 10 years in the wild, but can live to be much older in captivity. 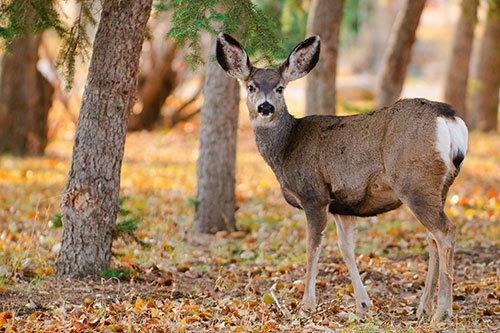 Mule deer and whitetail deer are oftentimes mistaken for each other. 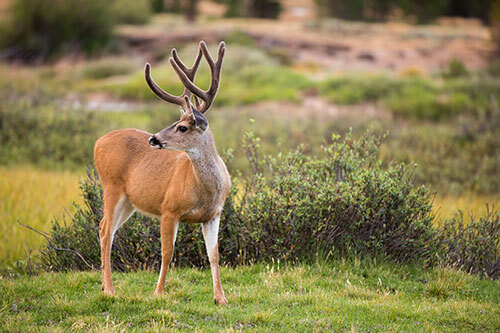 Mule deer are bulkier, have larger ears, a black-tipped tail, a whiter face, are a third larger, and have bigger antlers that fork out instead of branch from a single shaft. Mule deer have a 310 degree view around themselves because of the position of their eyes on the sides of their heads. A trophy mule deer buck may weigh up to 500 pounds. Mule deer are extraordinarily sensitive to moving objects. During the heat of the day, mule deer are generally inactive in order to regulate temperature and conserve water. They are more active in the early morning, late evening, and overnight hours. During the spring and summer, antlers can grow up to a quarter of an inch per day on large bucks. 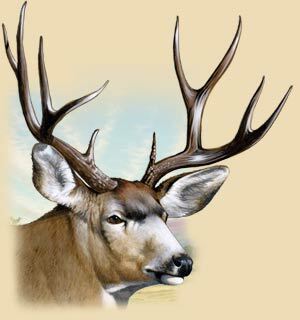 During the spring and summer mule deer antlers are very soft and tender, coated with velvet. Damage can easily occur during this period. In mid to late August, antler growth stops and the antlers harden. Average gestation of a mule deer is 204 days. Mule deer are generally born in May or June. Mature does often give birth to twins; yearling does generally have one fawn. Fawns typically stay with their mothers for the first year of their lives. 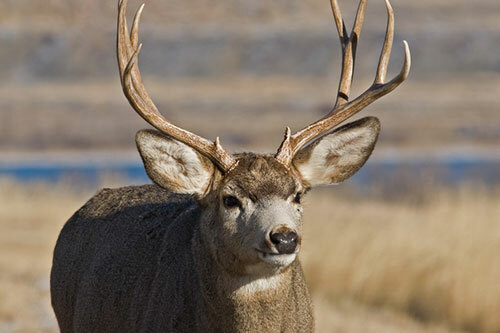 The major threats to mule deer are automobiles, hunting, and large carnivores like bears, mountain lions, and coyotes. Mule deer are not well equipped for fighting, so they stay alert and rely on their speed to avoid predation and human-inflicted harm. Mule deer are located in the entire western part of the United States and parts of western Canada. Though their preferred living area is the forest edge and mountains, they can adapt to anywhere such as a desert region. During the summer months, they tend to be found mostly in the mountains. During the winter months, they move down the mountains and into the valleys. What Do Mule Deer Eat? 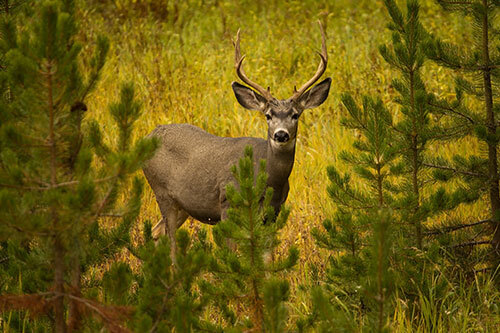 Mule deer are herbivores and chiefly forage on plants and berries. They enjoy shrubbery, grasses, twigs, leaves, mushrooms and vines. Mule deer are even known to forage in the summer on California Buckeye leaves, although there is evidence of that plant's toxicity. The sides of mountains and ridges have a lot of food that mule deer like to eat. Mule deer like to feed in the early morning and late evening. They are also active overnight. Because mule deer have such a keen sense of hearing, you should carry binoculars to spot them. Getting too close and making noise can scare mule deer away. The best place to spot trophy mule deer bucks is above the timberline. Bucks can be found at lower elevations but they will generally be smaller. Always familiarize yourself with your surroundings when out in the wilderness. To spot a deer, follow fresh tracks. Stay out of thick forests when hunting. You will not be able to get a clear shot if you spot a mule deer. Instead find a forest edge facing open land. Mule deer are hunted in the United States with both gun and bow. There are certain seasons in which hunting is authorized. Each state has different laws. Be sure to research the times and areas in which this activity is legal. 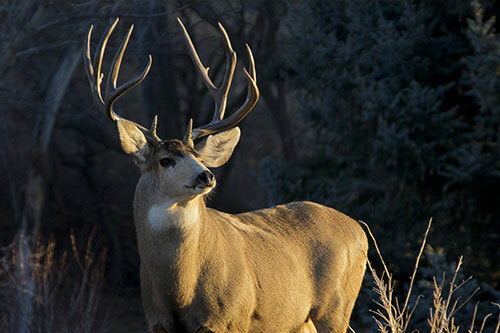 Mule deer hunting, like any other big game hunt, requires a hunting tag and license which gives permission to hunt. Harvesting a mule deer illegally can result in a fine, suspension or loss of hunting equipment, or even jail time. Bucks lose their antlers every year and many outdoorsmen partake in the sport of finding them, called shed hunting. This activity is a great way to spend time with your hunting buddies or family. Shed hunting enables you to “take inventory” of the bucks that have survived the fall hunt so you know what is still out there for next season. Search near food sources and bedding. Because squirrels and chipmunks will chew up the calcium-rich antlers, make sure that you search for them right around the time that they usually fall in your state. There is nothing worse than finding a nice antler all chewed up. When searching, walk very, very slow and look right in front of you, not off into the distance. Bring a pair of binoculars to scan the area before walking it and to save some leg work for when you think you see an antler in the distance. While most people just keep their collection of antlers, some people sell them. 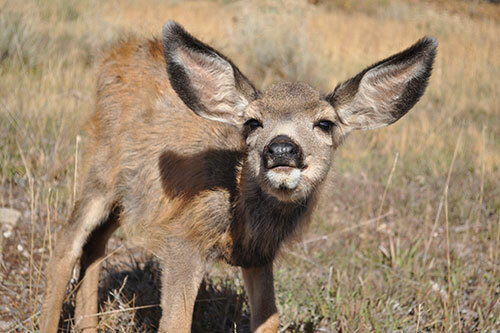 Mule Deer are extremely aware of their environment, they have excellent vision and hearing. 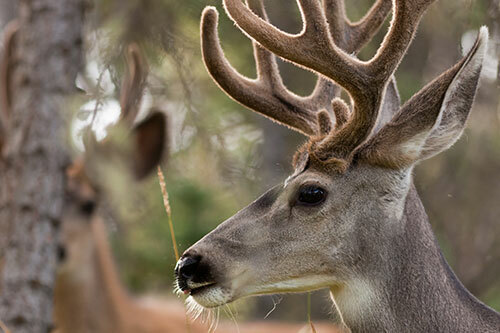 In the spring and summer months, mule deer antlers are soft and tender, coated with velvet. Mule deer will bound away at the first sign of danger. 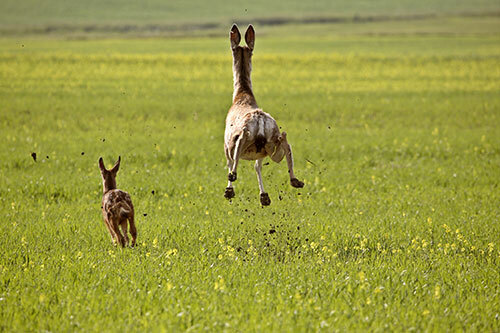 Their unique leaping gait allows them to change directions in a single 'hop', and all four of their legs touch the ground at the same time while running. Interested in Mule Deer Gifts & Decor? Visit the Mule Deer section of our wildlife store!